Marketing automation. Maybe you’ve heard of it, maybe you haven’t. In any circumstance, marketing automation tools can be a great resource to help you make your marketing processes streamlined and efficient. So what features does a good marketing automation tool consist of, and what marketing plugin is truly the best one out there? We’re here to tell you all the details! Marketing automation is software or a plugin that’s purpose is to automate marketing actions such as social media posting, email campaigns, lead management, landing pages, forms, and buttons. Marketing automation tools make these processes easier and more efficient to complete. What’s the Best Marketing WordPress Plugin or Tool for Small Business Owners? Let’s begin by saying that not all marketing automation tools are created equally. There are a lot of different options out there that vary in both cost and features. We’ve tried a lot of these tools and quite frankly, found they were either good but expensive or affordable and uninspired. So what did we do? We created our own marketing automation tool, The Inbound Brew Plugin. The Inbound Brew Plugin is a full-featured marketing automation tool that’s both affordable and easy to use. The Inbound Brew Plugin harnesses the power of automation to generate revenue with less manual effort. The result? Smarter strategies. More customers. Less time… All from one, user-friendly Dashboard. Getting started with Inbound Brew is a cinch! No strings attached and no signups required. It’s free and takes about two minutes to install… Winning! Upload the ‘inbound-brew’ directory to your ‘/wp-content/plugins/’ directory, using your favorite method such as ftp, sftp, scp, etc. 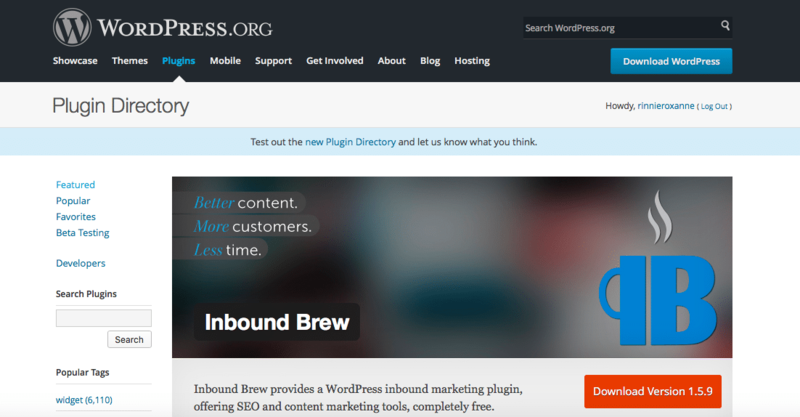 Activate Inbound Brew from your Plugins page. Enable pretty permalinks. They help your Landing Pages work better! Lastly, it’s important you continue to check back frequently to update your version of the plugin. We are constantly making updates to Inbound Brew to make your user experience even better! After you’ve completed these steps, you’re ready to rock! Let’s dig into the Plugin’s features and how to use them.